Regardless of what many may think about Montreal’s sport culture, our passion starts but goes beyond hockey. The proof is out there and you don’t even need to dig that deep to find it. Social media and local radio driven rallies organized to return the Montreal Expos back to the city, bring out hundreds of supporters. The MLB franchise moved from Montreal to Washington nearly ten years ago and it seems support is always growing, even among the city’s youth who were too young to remember the team or its players. Most Montrealers are more than content with the success and failures of Les Canadiens. Be that as it may, scores of Quebec Nordiques fans often make their presence known throughout various NHL arenas during hockey season, holding rallies in the stands and making it clear they want their team back. 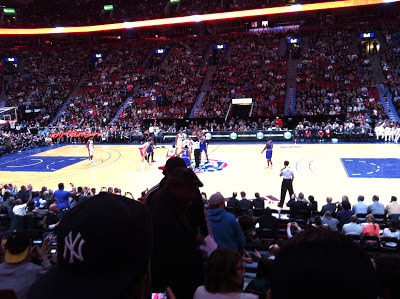 Since there is no NBA team to bring back to Montreal, fans are doing the right thing by letting the NBA know, “If you build it, we will come.” Showing them by selling out the 20,000 seats of the Bell Center for the second time in two years for an NBA preseason game. Admittedly, the hype surrounding this year’s preseason game between the Toronto Raptors and the New York Knicks was considerably less than it was in 2010. That game sold out in 3 days with the help of mass marketing. This year the tickets still managed to sell out a few days before the event, however I did notice less radio, billboard and online marketing this time around. Perhaps they knew as I did that the game would sell out either way. It was raining all day leading up to the game and I wondered while waiting for the train if that would affect attendance. Getting to the arena early only reinforced my concern as I was free to walk about the arena without having to squeeze my way through a crowd as I did a few years back. I used the opportunity to pose with the Larry O’brien trophy which was on display in the main lobby and asked three of the very friendly Raptors Dance Pak members for a group photo as they walked by. Even though fans took their time getting to the arena, it felt as if the arena filled within minutes leading up to the tip off. Fan loyalty was not Raptors or Knicks specific, as Montreal NBA fans wore an array of team jerseys, shirts and hats representing nearly every team. There was a great deal of support for Jose Calderon by a group of fans waving Spanish flags in one of the lower bowl sections, catching a few looks and smiles form the Raptor’s point guard. Andrea Bargnani also received full throttle cheers for every made basket and the crowd “ooh’d and ah’d” every time Jonas Valanciunas banged around in the paint, got a block or scored a bucket. Carmelo Anthony, Amar’e Stoudamire and Jason Kidd also received huge ovations when checking into the game or when making big plays. There was no questioning the crowd’s excitement as they cheered for every three pointer, dunk or fast break play, regardless of which team or player was responsible for it. Fan support in the Bell Center was unbiased until the 4th quarter when the “boo-birds” came out, letting the Knicks players know that even though they were appreciated, the Toronto Raptors are truly Canada’s team. When the game was all said and done and the Raptors had won, the 20,000 plus fans at the Bell Center showed their appreciation for both teams and the NBA with a standing ovation, allowing all three to recognize they are welcome back any time. As Montreal basketball fans exited the arena and began to flood the downtown streets, some headed to bars, club after parties, restaurants or simply stood in front of the arena to reminisce about the game. This has once again proven that support for basketball is undoubtedly strong in Canadian cities and our hope is that two sold out games, and hopefully more to come, this will soon bring not only preseason games, but eventually regular season games to various Canadian cities. The ultimate goal of course being another Canadian NBA expansion team. One step at a time, or in this case, one sell out at a time.